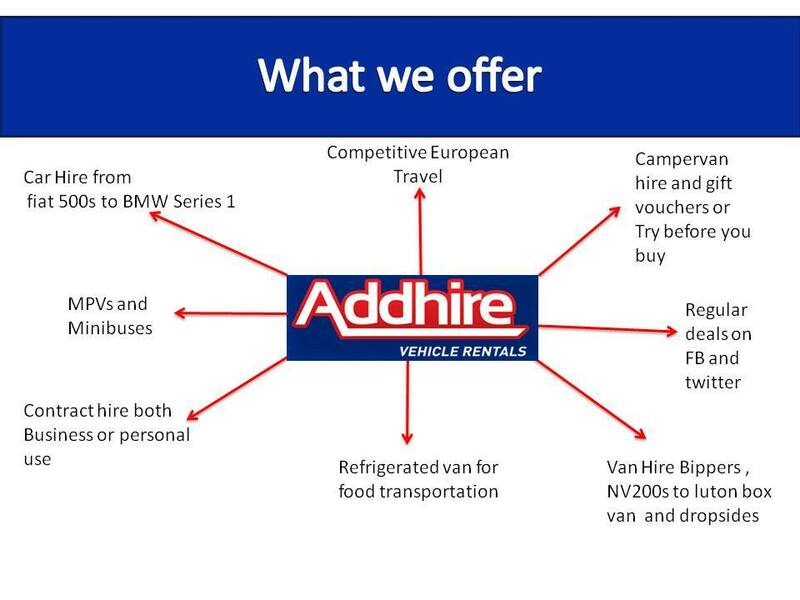 Addhire Vehicle Rentals is a family run car and van hire company, based in Ellesmere Port, providing vehicles solutions across the Wirral, Chester and Cheshire. We also offer nationwide camper van hire! Addhire offers self drive hire across a variety of vehicles for both business and personal use, whilst providing a reliable and friendly service. Our reputation for providing the best choice of vehicles, terms and service has been built up over 30 years and we take pride in being the number one choice for vehicle hire services on the Wirral. We like to spend time getting to know our customers, who come back to us again and again when they are looking to hire a car or van locally. As part of our continued commitment to our business and customers we moved from our original location in Little Sutton to our new, bigger premises on Rossmore Road, enabling us to provide more comprehensive options for car and van hire to our customers. Our experienced team is available to help you with your vehicle rental solutions. Contact us for more information.